Rooms & RV sites looking over the Hood Canal. This laid-back waterfront motel and cabin resort is a 13-minute walk from Potlatch State Park and 14 miles from Shelton. Our cabins, rooms, suites and RV park are on the waterfront and feature incredible views and amazing sun rises. 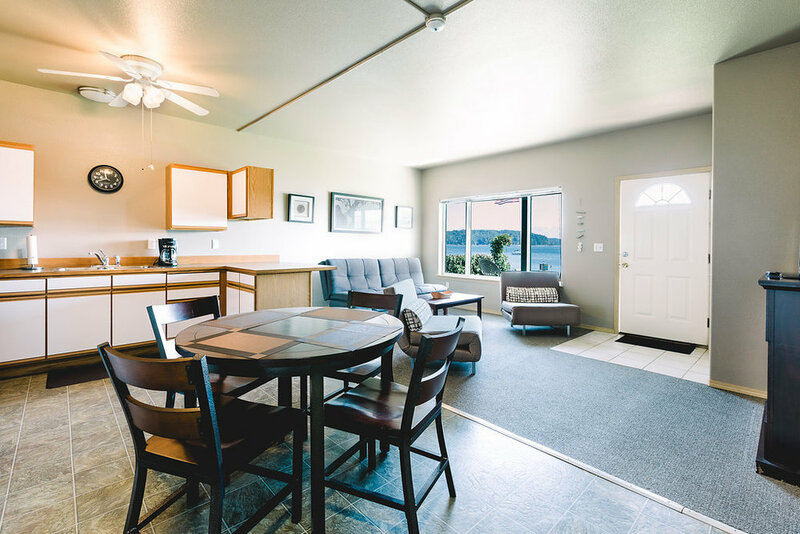 We offer some of the most diverse and enjoyable lodging on Hood Canal. 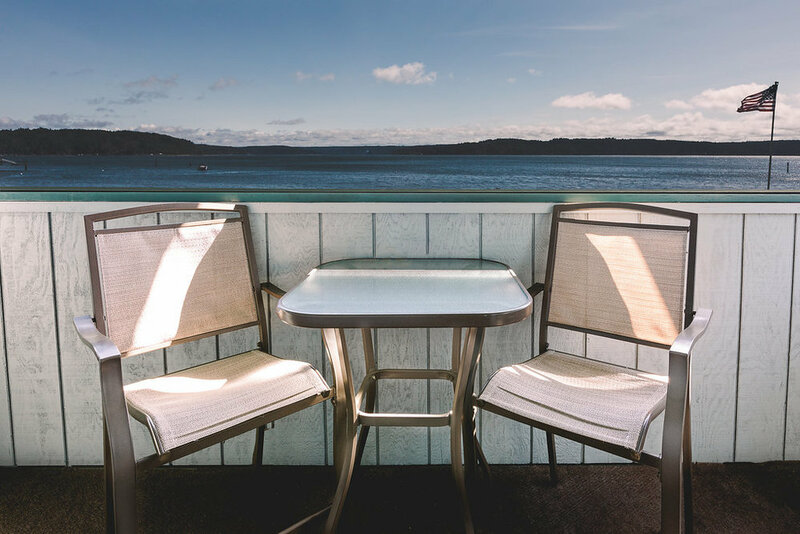 The Waterfront at Potlatch Resort is the perfect place to spend a day, a week or a month! Our 1 Bedroom Cabin with Loft is fully furnished and includes dining and living area, 1 bedroom plus loft, full bath and fully equipped kitchen with fridge, range, dishwasher, microwave, coffee pot and all the essentials. 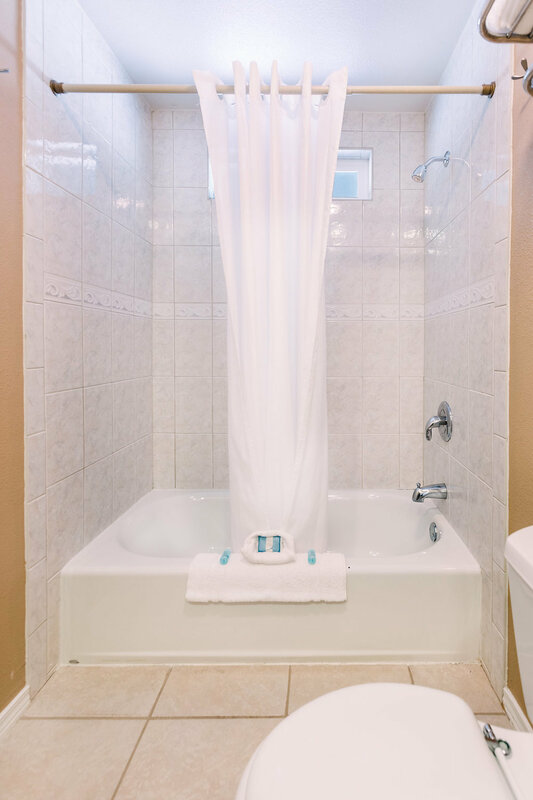 Amenities include wireless internet access, cable TV with DVD player, AM/FM clock radio, coffee maker, refrigerator and microwave. The cabin has a maximum occupancy of 4. The bedroom has a Queen size bed, the unfurnished loft is suitable for sleeping bags, and the living room has a Queen sleeper sofa. All cabins are nonsmoking. Smoking is permitted on the deck. Sorry, no pets in cabins or the motel. Our 1 Bedroom Cabin is fully furnished and include dining and living area, 1 bedroom, full bath and fully equipped kitchen with fridge, range, dishwasher, microwave, coffee pot and all the essentials. Amenities include wireless internet access, cable TV with DVD player, AM/FM clock radio, coffee maker, refrigerator and microwave. The cabin has a maximum occupancy of 4. The bedroom has a Queen size bed, in the living room there is a Queen sleeper sofa. All cabins are nonsmoking. Smoking is permitted on the deck. Sorry, no pets in cabins or the motel. Our 2 Bedroom Cabins are fully furnished and include dining and living areas, 2 bedrooms, full bath and fully equipped kitchen with fridge, range, dishwasher, microwave, coffee pot and all the essentials. Cabin amenities include wireless internet access, cable TV with DVD player, and AM/FM clock radio. The cabin has a maximum occupancy of 6 people. There is one bed in each bedroom, a King and Queen. In the living area is a sleeper sofa. All cabins are nonsmoking. Smoking is permitted on the covered porch/deck. King Bed, Queen Bed and Sleeper Sofa as well as featuring a full kitchen, dining area and family room. Plus, a walkout patio and fenced in backyard. Enjoy great waterfront views from your suite or private balcony. 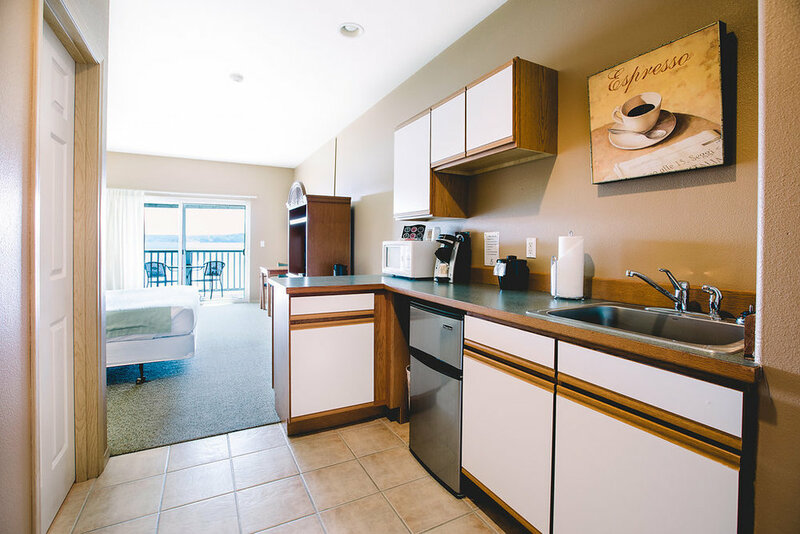 This suites feature wireless internet access, cable TV with DVD/VCR, AM/FM clock radio, refrigerator, microwave and coffee maker. All suites are Waterfront/Water view. All suites are nonsmoking. Smoking is permitted on patio where allowed by Washington State law. Sorry, NO PETS. Be sure to use the comfortable common room available to anyone staying with us at Waterfront. Enjoy great waterfront views from your suite or private balcony. These large well appointed rooms include a King bed and a Queen sofa sleeper for a maximum of 4 guests. Our King Suites feature wireless internet access, cable TV with DVD/VCR, AM/FM clock radio, refrigerator, microwave and coffee maker. All suites are Waterfront/Water view. All suites are nonsmoking. Smoking is permitted on Balconies where allowed by Washington State law. Sorry, NO PETS. These large nicely decorated rooms provide the comfort you expect and luxury that will surprise you. Individual covered balconies from each room. 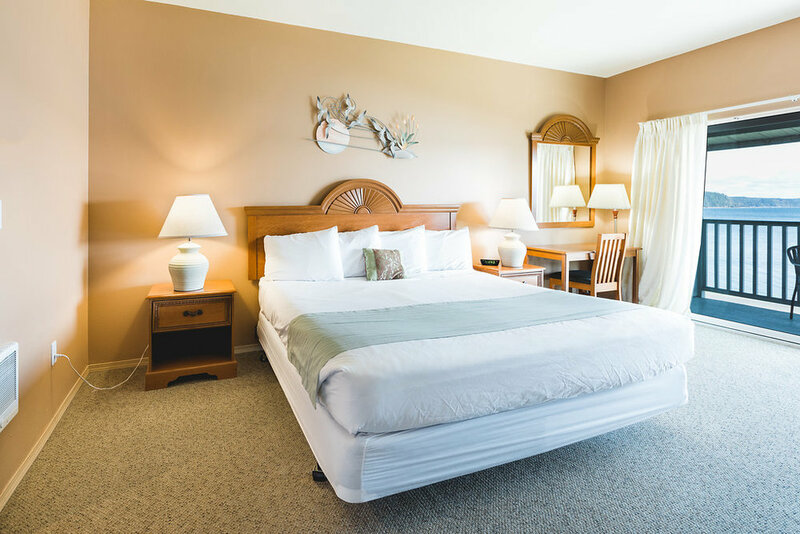 Our King guest rooms sleep a maximum of 2 guests and feature wireless internet access, cable TV with DVD/VCR player, AM/FM clock radio, coffee maker, refrigerator and microwave. All have a Waterfront/Water view. The inside of the motel is nonsmoking. Smoking is permitted on balconies where allowed by Washington State Law. Sorry, NO PETS. These large nicely decorated rooms provide the comfort you expect and luxury that will surprise you. Private covered balconies from each room. 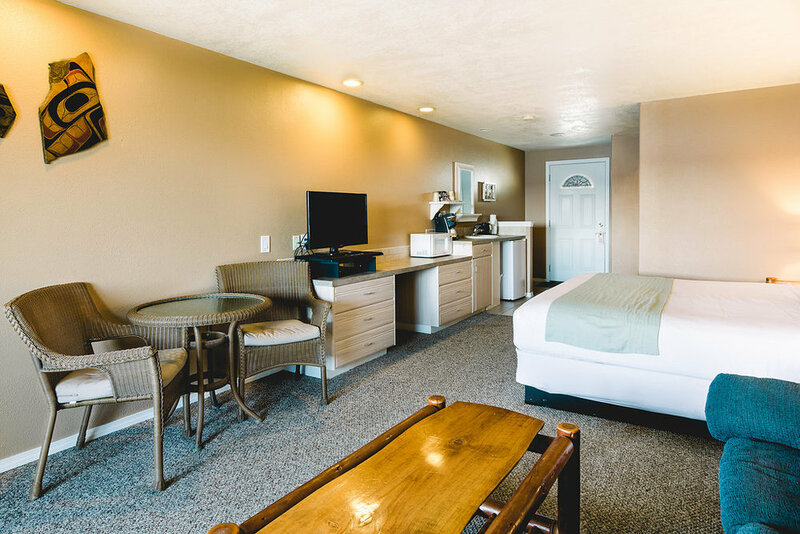 Our Double Queen guest rooms sleep a maximum of 4 guests and feature wireless internet access, cable TV with DVD/VCR player, AM/FM clock radio, coffee maker, refrigerator and microwave. All rooms are Waterfront/Water view. No smoking inside. Smoking is permitted on balconies where allowed by Washington State Law. Sorry, NO PETS. 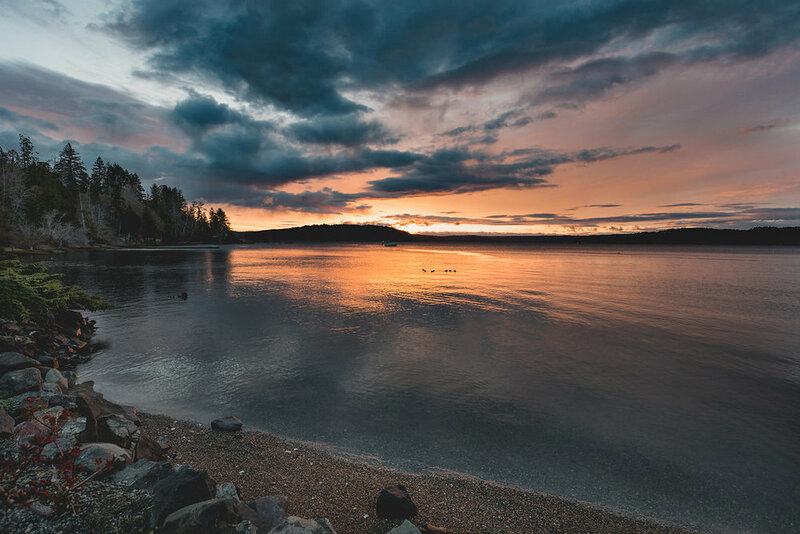 Our Deluxe and Premier Waterfront RV Sites are spacious RV Sites with 50amp service, parking for tow vehicles, and have a little more room than our Standard 30amp RV Sites. 450 feet of no-bank waterfront is steps away as are sunrises and sunsets. Our Standard RV Sites are either on the waterfront or feature great water views. Waterfront standard are 30amp service and roadside are 50amp service. Slightly smaller than our deluxe sites. These sites feature full hook-ups, cable TV and wireless internet. The views will take your breath away. Sites 1, 2, 3 and 16 are in close proximity to the road and are 50amp service. All RV Site rates are for 2 people. Additional people are $5 each per day. 1 RV plus 1 vehicle per site. Additional vehicles are $10.00 per night. Sites 6-9 do not have tow vehicle parking. Must park tow vehicle up by the office. Sealed sewer connections are required. A sanitation fee of $250.00 will be charged for any sewage spills. Sorry, no tents, tarps, or canopys allowed. For tent camping opportunities see Skokomish Park. Stays longer than 30 days require moving to a new site.